Have them model the correction procedure rather than the latest fashions. You can’t just tell your students the three steps of the Rocket Math correction procedure. That’s not enough to be sure they know it. The best way to determine if the students know the procedure is to require them to model it. Require them to model the correction procedures while you role play being a student making errors. When you make an error. When you say the problem wrong. When you don’t say the whole problem and the answer. 1. Stop. 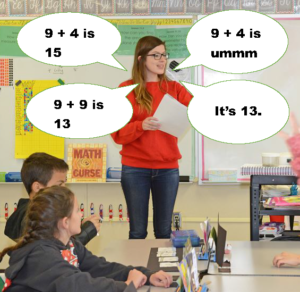 Interrupt the student and say the correct problem and the answer. 2. Repeat. Have the student repeat the correct problem and answer three times. 3. Back up. 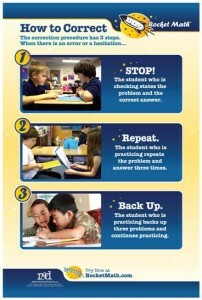 Have the student back up three problems and begin again. Third, begin practicing as if you were a student and then make errors. Then require the student you’ve selected to be your checker to model the three-step correction procedure. They should interrupt you and say the whole problem and the answer, ask you to say it three times, and then after you’ve repeated it three times, they should tell you to back up three problems and begin again. You’ll end up counting together and coming to agreement about where to start and then beginning again. But remember, they have to know not just HOW to correct, but also WHEN to correct. Fourth, be sure to make all four kinds of errors to see if your “checker” recognizes all of them. Try reading just the answers and see if your checker follows the correction procedure. Definitely do a two second hesitation and if they don’t jump in to correct you, prompt them to do so. Read the problem wrong as well as say the wrong answer. Prompt the correction procedure if the student doesn’t do it the right way or at the right time. If you have to prompt a student then they aren’t ready yet. Keep going around the class, calling on each of your students to be your checker, and make sure they do it correctly and prompt them if they don’t. Go back and call on any students who needed prompting and see if they can do it without prompting now. Keep making them model the correction procedure until everyone can do it the right way WITHOUT PROMPTING.